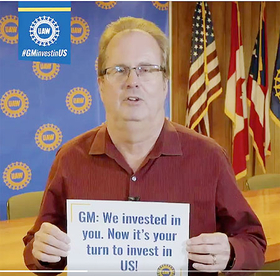 While the first video attempts to pull at emotional heart strings, the second is far more aggressive and targeted — characterizing GM's recent decisions as greedy and unnecessary. It compares GM's expected production in Mexico and the U.S. against Ford Motor Co.'s through 2020. 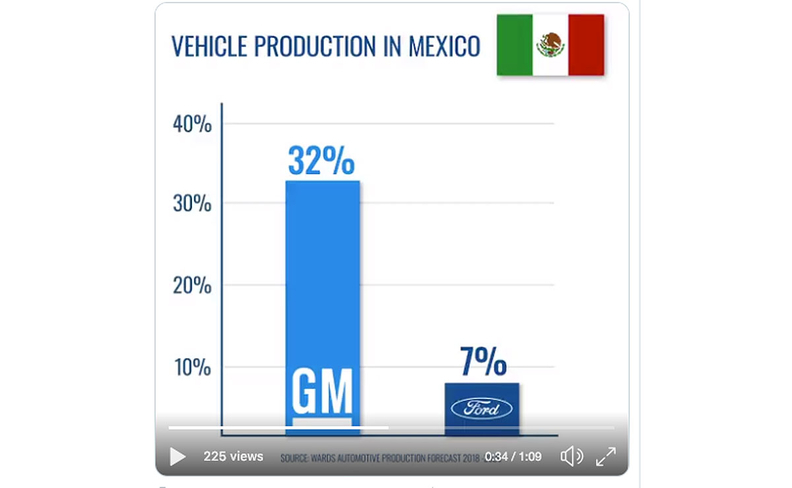 Citing WardsAuto production forecast data, the video states 32 percent of GM's North American production will come from Mexico during that time, while Ford is at 7 percent. That compares with 82 percent for Ford in the U.S. and 61 percent for GM. "GM is committed to maintaining a strong manufacturing presence in the U.S., as evidenced by our more than $22 billion investments in U.S. operations since 2009 and more to come this year. For example, we have invested more than $4 billion to support full-size trucks and SUVs in Michigan, Indiana and Texas. GM has said two U.S. assembly plants — Lordstown Assembly in Ohio and Detroit-Hamtramck in Michigan — will end production this year and have not been allocated new product. Powertrain plants in Warren, Mich., and Baltimore don't have products assigned after this year.